I have just spent a day in Waterford, staying overnight in Treacy’s Hotel on Merchant’s Quay. I have known this city since my childhood, and this is my second time in Waterford in recent months, having visited the city at the end of last August  on my way to Kilkenny. 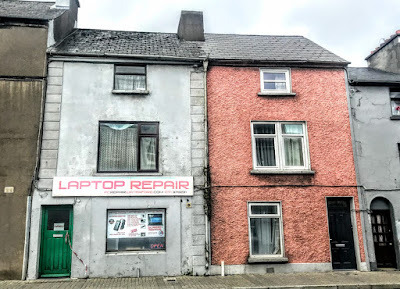 During my walk around the city yesterday [14 March 2019], I went in search of the story of Waterford’s lost Jewish community and the site of the former synagogue. Although individual Jews are known to have settled in Waterford from as early as 1701, it was not until the late 19th century that there were enough Jews in the city to organise a community and establish a synagogue. Even then, the Jewish community in Waterford never numbered much than 60 people. It probably reached its peak just before World War I and went into decline in the interwar years. 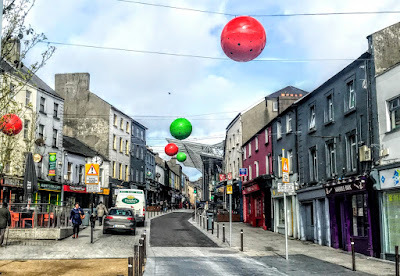 The first Jews arrived in Waterford at the close of the 17th century, when the corporation made a positive decision to encourage foreign merchants to settle in the city. Jacob Nunes applied to trade freely in the city and was given the freedom of the city to conduct trade in 1701. Jacob Nunes appears to be the first Jew to have lived in Waterford. His name indicates he was from a Sephardi background, descended from a Jewish family from Italy or from Jews who had fled Spain and Portugal after 1492 and 1497. For example, the Nunes Vaz family of Amsterdam traces its documented roots back to Livorno in Italy in the late 17th century. Jacob Nunes Vaz, the patriarch of the Nunes Vaz family of Amsterdam, was born in 1697 in Livorno to Abraham Nunes Vaz. It is believed the family originally came from Portugal and there is a family story that there were originally four Nunes Vaz brothers who left Portugal and went to different parts of the world. Individual Jews lived in Waterford in the 18th century, and later Josias Jacob, a Jew living in Waterford, registered with the Dublin Goldsmith’s Company in 1809. Louis Hyman suggests that in the mid-19th century, the grandparents of the late Professor James Desmond Bernal (1901-1971) settled in Waterford. This family was of mixed Italian and Spanish/Portuguese Sephardic ancestry. Jacob Genese had adopted the family name Bernal of his paternal grandmother around 1837, but the family history indicates he moved from Dublin to Limerick rather than Waterford. Although these early Jews in Waterford were Sephardi Jews, and by 1871 the census returns show only one Jew living in Waterford. However, in the decades that followed, the laws against Jews in Tsarist Russia brought new Jewish settlers to Ireland. The new Jewish immigrants arrived in Dublin, Belfast, Limerick and Cork, and the community that developed in Waterford in the decades that followed immediately was made up of almost entirely Ashkenazi Orthodox Jews. Many Jews who moved to Waterford also came from Wales, where they were part of the Jewish community in Britain descended from middle-class immigrants from Central Europe. They were known in Ireland as ‘English Jews,’ and their lives were a sharp contrast with the lives of Jewish families fleeing pogroms and persecution in Russia. The Waterford Hebrew Congregation founded the city’s only synagogue on Manor Street in 1893, and the Jewish historians David Shulman and Harold Pollins give the address as 56 Manor Street. Shortly after the death notice of Joseph Diamond, the Jewish Chronicle reported a congregation had been established in Waterford in 1893, with Mr R Smullian as president, and so prayers were held for the Jewish New Year, Rosh Hashanah. A year later, the Jewish Chronicle reported that Mr and Mrs Goldring had presented a Torah scroll to the newly-established congregation. In the evening, they gave a party to which every Jewish resident of Waterford was invited. Mr M Simon presided and great satisfaction was expressed by the chairman, Mr Hanasan, president of the congregation, Mr R Smullian, Mr Levy, Mr Diamond and others at the formation of the congregation. The formation of the new congregation brought new life to the Jewish community. But one of the new arrivals in the city, Joseph Diamond, died in 1893 at the age of 68. He had lived at 8 Manor Street, a city centre street that came to play a central role in the life of the Jewish community in Waterford. The following year, the first Jewish wedding in Waterford attracted wider attention in 1894. Fanny Diamond and Jack Lappin were married in the synagogue at 88 The Manor, with many Christians present. The ceremony was performed by the Revd JE Myers of Cork, assisted by the local minister, the Revd Simon Aarons. The Revd JE Myers also preached on Sabbath morning and at a special service on Sunday evening attended by several Christians. The reports noted that Mr William Goldring, President, and his wife have made handsome presents to the synagogue. Mr Robinson was the treasurer and Mr J Levy was the honorary secretary. The development of the community was of particular interest to Myers, who visited Waterford on many occasions. However, there was no Jewish cemetery in Waterford, and when Isaac William Goldring, President of the Hebrew Congregation, died in Waterford in 1898, his body was taken to Dublin and buried in the New Cemetery. As the Jewish community grew and developed in Waterford, children were born into families in Waterford, and some members of Waterford’s Jewish community got involved in politics. Harris Sherowitz sent a letter to John Redmond MP in 1905, signed by many, hoping he would seek amendments to the Aliens Act. By 1901, the small Jewish community in Waterford was centred mainly around John Street and Manor Street. A wedding in Waterford in 1907 was conducted by the Rabbi Elias Bere Levin of the Limerick Hebrew Congregation. The community was growing, and by 1913 a Hebrew School was running on Sundays. The John Street and Manor Street area was still the heart of the Jewish community in 1911, when the census shows 62 Jewish people living in Waterford, and so it continued until the beginning of World War II. At the end of 1918, the Jewish Chronicle reported that at an examination of the Pharmaceutical Society of Ireland, Samuel Aaron Rosenthal, son of Mr and Mrs J Rosenthal, late of Waterford and by then living in Dublin, had passed the final examination of the London Pharmaceutical Society Institute. Samuel Rosenthal was born in Cork, and later became a well-known pharmacist in Dublin. Until 1960, he lived at No 104 Rathfarnham Road, a house that is part of my many happy childhood memories. The local newspaper, the Munster Express, published a small notice about Yom Kippur, the Day of Atonement, in September 1931, but also carried an antisemitic joke in June 1936. A local District Court judge told a member of a Jewish family that he should count himself lucky, given what was happening to his people in Hitler’s Germany. At its peak, the synagogue in Waterford had a congregation of 62. By 1946, the number of Jews living in Waterford had fallen to 15 by 1946, and almost 40 years later the number had fallen to just six in 1985. In the 1991 census, nine people in Waterford declared themselves Jewish. It is surprising then that the latest census figures put the number of Jews in Waterford at was 26 in 2016. Maurice Woolfson, a Waterford-born Jew, was a celebrated figure in football life in Waterford. He was born in Waterford in 1910 to parents who left Riga in 1888, and their family home was in the house in Manor Street where the top floor was the synagogue. In the 1930s, Maurice Woolfson led the local club Evergreen to great victories in the 1930s. In the same decade, Isaac Woolfson chaired the Waterford and District Association Football League and was a key figure in establishing the first Employers’ League in 1931. Maurice Woolfson was chair of Evergreen when they won the FAI Minor Cup in 1938, beating Sligo United 2-1 at Kilcohan Park in the city. When he left Waterford for Dublin in 1940, he was sorely missed in the club. He died in 1969. Four Woolfson brothers – Max, Solly, ‘Duffy’ and Simon – returned from Boston and Dublin to Waterford in 1971 to inaugurate the Maurice Woolfson Perpetual Challenge Trophy for the Under-15 local Schoolboy League. The trophy was launched by their nephew, Bryan Woolfson from Dublin, at half-time during a match between Waterford and Shamrock Rovers. Later, The Irish Times described the cup as a trophy ‘that must rank among the finest in Irish soccer. 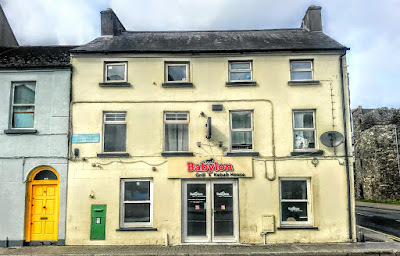 As I wandered around the area of John Street and Manor Street in Waterford yesterday afternoon, I could not figure out whether the synagogue was at No 56 or No 88 Manor Street. But this just serves to illustrate that every city that had a Jewish community and synagogues in the past needs a Jewish walking trail as reminder of a community that is part of the mosaic of our identity, as a reminder that as memories of the Holocaust grow dim we must never forget, and as an antidote to the ugly rise of antisemitism across Europe today. Louis Hyman, The Jews of Ireland: From Earliest Times to the Year 1910 (Shannon: Irish University Press, 1972). Ray Rivlin, Jewish Ireland: A Social History (Dublin: The History Press, 2011). David Shulman, ‘The former Waterford Jewish Community & Hebrew Congregation’ (2014, revised or updated 2016). David Toms: ‘Jewish Waterford, 1893-1940’, The Dustbin of History (2014).